BeautyScraps: UnBoxing & Alternative Card Idea #1: January 2018 Paper Pumpkin Kit Heartfelt Love Notes by Stampin' Up! UnBoxing & Alternative Card Idea #1: January 2018 Paper Pumpkin Kit Heartfelt Love Notes by Stampin' Up! January 2018 Paper Pumpkin Kit! This month's kit is called "Heartfelt Love Notes" and it includes everything you need to create 16 adorable pocket cards! The video above shows you everything included in the kit this month and how to create the projects as they were originally designed. You really get a lot of bang for you buck. The kits are only $19.95 a month & that includes shipping! You can buy pre-paid subscriptions to Paper Pumpkin in my online store or you can choose to subscribe month to month. Since Sale-A-Bration has begun, I totally recommend getting a prepaid subscription. I bought a 12 month subscription myself, so I got to choose 4 Free Sale-A-Bration items and Party Pandas Stamp Set was one of them so I wanted to use them together for my card today. 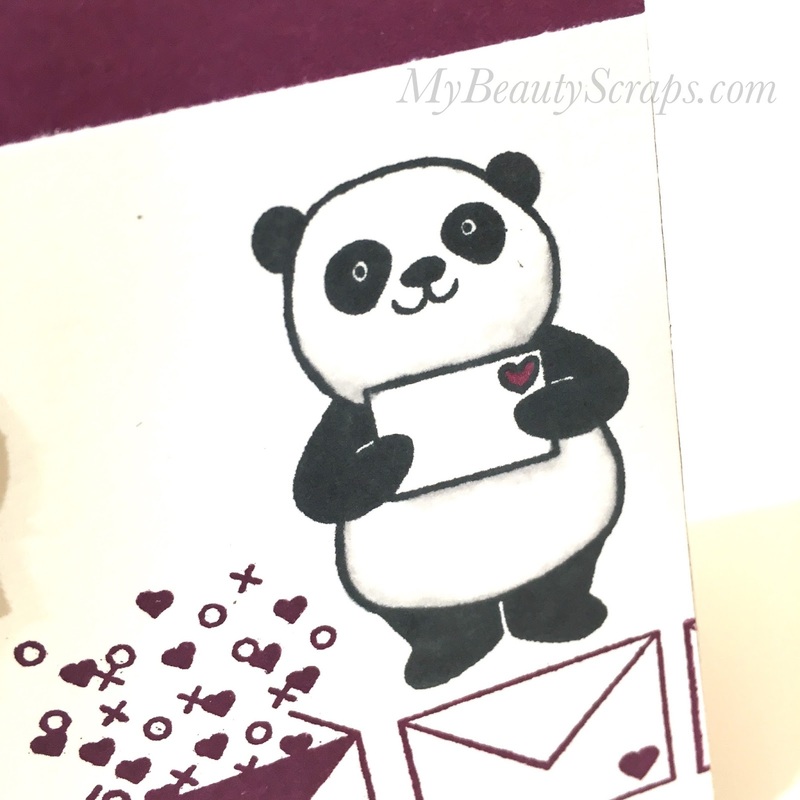 This sweet little panda with the heart envelope is perfect for a love or Valentine's Day themed card. I love how the Light Grey Stampin' Blend Marker adds just a little shadow to really bring life to this little guy. I have to admit, I fussed with this label for the sentiment for a while, but I love how it turned out! I usually do a double layer when using this punch for a sentiment, but the third layer with that gorgeous silver glimmer paper really stands out! In the video below you can see everything that came in the kit and watch my creative process making this card. If you are not yet a Paper Pumpkin Subscriber you really should get in on the fun! I love getting a creative surprise in my mailbox every month! If you would like to learn more, check out my Paper Pumpkin Perks & FAQs! And, remember you can earn Free Sale-A-Bration items with your 3, 6 or 12 month prepaid Paper Pumpkin Subscriptions right now! I would love to be your demonstrator and answer any questions you have. Feel free to Contact Me anytime! Use Host Code: T6HEKKA9 when you shop my online store in January 2018 for a Free Gift!